BUT … I’m really insecure about my savvy when it comes to writing out harp music. I’m really insecure when it comes to writing out harp music. Yes, despite writing for symphony orchestra – and even getting a Grammy Nomination for that composing – I’m insecure about writing out harp music. The fact is that, when I first starting writing for orchestra, I spent a lot of time studying the specifics of each instrument and then working one-on-one with other instrumentalists, singing them what I wanted to hear and asking them how to write it so they’d play what I wanted to hear. But I never did that with harpists because I was always playing the harp part myself. I’d barely write the harp part at all. I’d just make an outline – in text (like, Microsoft Word) – and then recreate it from the outline at every performance. The long-and-short is I have hundreds of songs I’d love to publish but I’m so insecure about writing them out that I might as well be intentionally keeping them hidden. 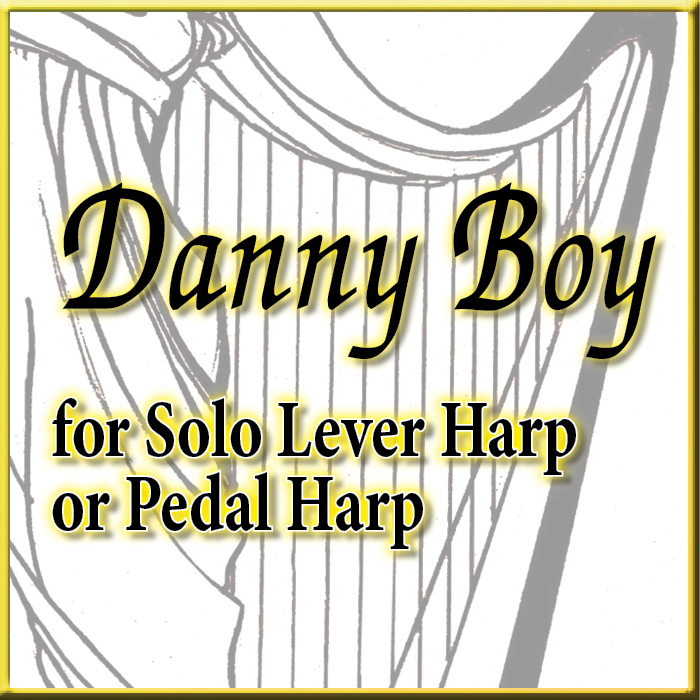 Including this sweet, re-harmonized version of Danny Boy which was completely unavailable – not findable, downloadable, printable or sharable except by 3 people in the world. “I didn’t want to mention it,” she said. But I knew it wasn’t OK.
“Sure! I can do a terrible version,” they say. So I sat down and did a terrible version. It was so terrible that all I did was open up the file I’d made last year when I first started the arrangement and look at it. Then I spent about an hour pushing notes around and I felt absolutely hopeless about knowing how to put anything on the page but the raw ‘data’ – just the notes themselves. And here’s the thing: To convey the meaning and intention of written music, you need to include phrasing, articulations, dynamics, tempo markings: everything that gives music character and life. And I have no idea how to do that – at least, when it comes to harp music. When I, myself, play written music (which is, like … never) I ignore everything except the notes and just play it the way I feel it based on the words to the song, or the images of the piece in my head – so I have almost zero experience as a music reader – and that means I’m basically oblivious to harp-notation conventions. But when you’re writing music for other people to read, you have to give at least some indication of HOW you want it played in addition to WHAT NOTES people are playing – and that’s the part that stymies me. So I sat there wondering how I could be so supposedly accomplished as a musician and so completely inept at this particular aspect of music. I suddenly got about 20 offers through the comments and private messaging. I sent the music off and a few hours later I started getting emails back. Some included links to videos, some included images of the sheet music with hand-written edits, some included beautifully catalogued bullet lists of suggested changes. I incorporated almost all of them, updated the sheet music 10 times. Suddenly this was getting FUN!! People were suggesting things I had sensed were needed but hadn’t been able to really pin down. And about version 6 it was starting to actually look like harp music. I made a web page to share the music. Two people had sent me videos that were so lovely I asked if I could share them on the web page, and I also added the wonderful comments people had sent me about the arrangement. And then, about 2 hours ago – I loaded the PDF onto the web and hit the ‘Publish” button. And now … this sweet little arrangement exists …. right here! 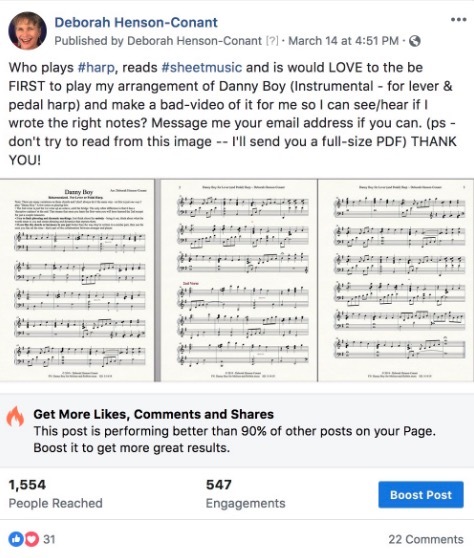 There are videos to show people what’s in the sheet music when they buy it and from now ’til March 31st – I have a code (“harpist”) that gets people 50% off. that helped me bring this arrangement to the light of day! Why is this such a big deal for me? Well, if you look at my sheet music catalog, you’ll see there are only six titles for harp – despite the fact that I’ve written over a hundred original pieces for harp – maybe closer to two hundred, and hundreds more if you count arrangements – but almost none of it is available for other people to play. Mind you, a LOT of people play some of those pieces, like The Nightingale and Baroque Flamenco – and I love seeing all the YouTube videos of them – but I might as well be hiding 95% of my music — and all because I don’t feel confident with my ability to represent it in writing so that others will understand what I’ve written in the way I meant it. I’m just curious … does that resonate with anyone else? I mean, getting past your fears of self-expression and sharing your creative gifts is a huge part of what I coach other people on in my online academy and my mentorship program! 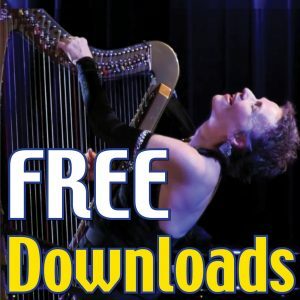 And yesh, yeah, yeah — there’s a ‘real’ aspect to my insecurity: I often play techniques that are either hard to notate or don’t even have standard notation – but that’s also one of the reasons I started Hip Harp Academy – where I can actually teach harpists these techniques vie video and live chat. That’s great … but I also want to be able to share my music in written form as well! So publishing this one simple tune: “Danny Boy” – which I didn’t even write (duh…obviously), but which holds a lot of my creative ‘voice’ and my commitment to the emotional power of harmony – this is a tiny miracle for me. I could not have done it without help. And I’m writing that slowly, emphasizing every word. I. Could. Not. Have. Done. It. Without. Help. Because I did get help, now any harpist anywhere in the world can buy this little piece and can expand their own repertoire of creative expression – just by clicking a button. They can connect just a little bit more in the world, bring a little more joy, a little more beauty. And Special Thanks to all the others who offered and didn’t have time to share before we published – thank you for your willingness! Melissa Gallant, Shelley Fairplay, Sally Walstrum, Darlene Deisinger, Felice Chen, Joanne Barriga Quintana, Petra Iván, Angelique Rissons, Angela Evans, Balbás Sarado McCartan, Sigrid Karner, Aline Hoeve, Gina Smith Bangerter, Michelle Efird, Cecile Elie Le Lievre, Lam By Zunny). I’m sure I misspelled a name or two … and certainly left someone off – if so, it’s only due to bad bookkeeping on my part – so please just let me know. And THANK YOU – THANK YOU. And thank you Mia for putting that suggestion in my head even though I swore up and down it was completely impossible. Now …. let me ask YOU … what are you really insecure about that you could do a really terrible job of? I encourage you with all my heart to start there.